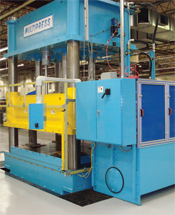 custom-designed special-purpose hydraulic presses, including the 650-ton deep-draw forming press shown. The press features an inner cylinder and lower reverse-draw cylinder, preset adjustable speed, pressure and position control, and touch-screen HMI with recipe storage. A variety of sophisticated electronics are available, including infinitely adjustable closed-loop control systems, supervisory PLCs, programmable multi-axis motion controllers, high-resolution force, position and velocity sensors, and data logging and communication to plant-wide production control systems.